Create an 11oz. 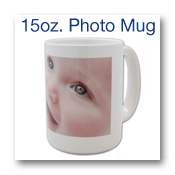 ceramic photo mug that can be used everyday. Features 1 horizontal wrap around image area. Create an 11oz. ceramic photo mug that can be used everyday. Features 2 vertical image areas. 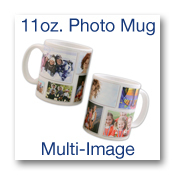 Create a multiple image 11oz. ceramic photo mug that can be used everyday. 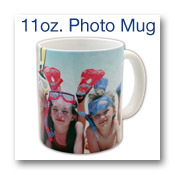 Features several images that wrap around mug. Several templates available. Create a 15oz. ceramic photo mug that can be used everyday. Features 1 horizontal wrap around image area. Create a 15oz. ceramic photo mug that can be used everyday. Features 2 vertical image areas. 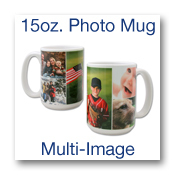 Create a multiple image large 15oz. 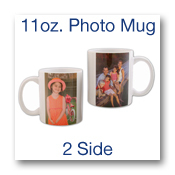 ceramic photo mug that can be used everyday or given as a gift. 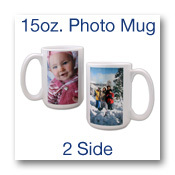 Features several images that wrap around mug. Different image templates available. 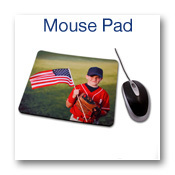 Make mousepads with your photos that will look great on any desk.